Heat oven to 350 degrees F. Grease 2 9-inch square pans or 3 8-inch round pans. Pour boiling water on chocolate, stirring until chocolate is melted; cool. Mix sugar and butter in large mixing bowl until light and fluffy. Beat in eggs yolk, one at a time. Beat in chocolate and vanilla on low speed. Mix in flour, baking soda and salt alternately with buttermilk, beating after each addition until batter is smooth. Fold in egg whites. Divide batter among pans. Bake square pans 40-45 minutes or round pans 35-40 minutes. Check for doneness with toothpick in center. 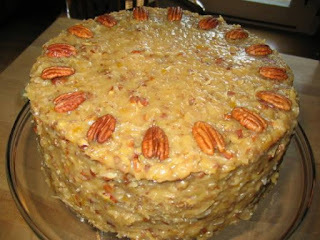 Cool and top with Coconut-Pecan Frosting. Coconut Pecan Frosting: Mix sugar, butter, milk, vanilla and egg yolks in saucepan. Cook over medium heat, stirring occasionally, until thick, about 12 minutes. Take off heat. Stir in coconut and pecans. Beat until spreading consistency. Allow to cool & thicken before icing cake.